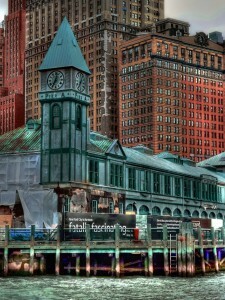 Battery Park, sometimes referred to as The Battery, is located at the south end of Manhattan, NYC. It sits facing the Hudson River. Tourists and New Yorkers alike come to Battery Park to spend sunny days enjoying the view of the Statue of Liberty. From Battery Park you can catch a ferry to go to Ellis Island or the Statue of Liberty. The Pier A building shown in this jigsaw puzzle is the last pier remaining in the area and is cherished by the locals and tourists alike. Plans to renovate it have been protested by people who believe it is beautiful the way it is. Credit: Special thanks to Joiseyshowaa for making the photograph used for this jigsaw puzzle available through the Creative Commons Attribution ShareALike license. Visit Joiseyshowaa's Flickr photostream. See all jigsaw puzzles based on Joiseyshowaa's photographs.